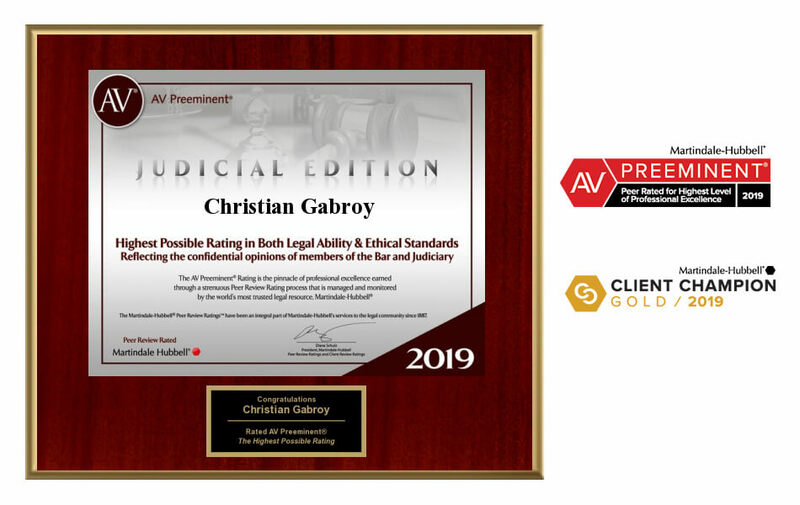 Congratulations are in order as Christian Gabroy was recently awarded the 2019 AV Preeminent Rating by Martindale-Hubbell. This 2019 AV Preeminent Rating distinction is the Highest Possible Rating for both the lawyer’s Legal Ability and their Ethical Standards. These reviews demonstrate the opinions submitted by other members of the Bar and by the Judiciary. Achieving the 2019 AV Preeminent Rating demonstrates the peak of professional excellence that an attorney can earn. It is only through an arduous process of reviewing Ratings given by the attorney’s peers that these awards are bestowed. The whole process is managed and monitored by the world’s most trusted legal source, Martindale Hubbell. He was a rated perfect 5.0 stars out of 5.0 stars from 30 peers (other lawyers) reviews and 5.0 stars out of 5.0 stars from 6 client reviews. Being bestowed the award of AV Preeminent® is a noteworthy accomplishment in ratings – a witness of the fact that an attorney’s peers rate him at the uppermost level of professional excellence. The process of Martindale-Hubbell® Peer Review Ratings™ equals the gold standard in the rating of attorneys. They have acknowledged attorneys for their capable legal ability and high ethical standards for more than 100 years. Lawyers who need to refer a client, as well as any potential clients who are looking for an attorney for their own legal case, can use these ratings to assess and identify the most appropriate attorney for their legal matter. The Martindale-Hubbell Client Reviews Rating offers the views of a client. Who would be better to explain the services and type of counsel that an attorney or law firm has provided them than the one who has retained them? Used together, the peer review ratings and the client review ratings convey an overall view of a particular attorney’s legal capabilities and the level of service they have offered, which is beneficial to the entire legal community. One of the reasons this award is such an honor is that it is only bestowed on a select few. Only about 10% of all attorneys are awarded the 2019 AV Preeminent Rating. Because of this, it is a designation that can be trusted by clients and those who need to refer clients for other legal services. If you have been searching for an attorney to handle your legal issue, you can feel confident in reaching out to our office, where you will receive the best possible service to resolve your case. Contact our office online or by calling 702-259-7777 to schedule an initial consultation.